The following is a step-by-step guide to the methods used to achieve ISO calibrated output using Serendipity Blackmagic / Megarip version 6.0+. The setup described below is for an Epson 7900 being calibrated to a Fogra 39 standard. Linearisation Curves will be generated using Lab mode. If any terms or functions mentioned are unfamiliar please refer to the V6 User Manual available on the installation DVD or via the Serendipity Software website. Create and save an Output datatype in the Workbench, choosing the Epson 7900 driver with the relevant settings for Queue, Destination and Collating requirements. Create and save a Media datatype in the Workbench. Selecting the Epson 7900 output driver. Make sure a CMYK ICC profile is selected for the Output ICC profile. The default Standard SWOP is fine, although CMYK profile will do for this stage. Create and save a Job Ticket datatype in the Workbench. In the Colour Management tab of the Job Ticket, set the Press Input ICC Profile to an ISO/Fogra profile. In this example we will be using ISOCoated_v2_eciF39. If the profile is not currently in the database, click the Upload Profile button in the ICC chooser pop-up navigate to the profile. Set the Rendering Intent to Relative or Absolute Colourimetric. The rendering intent does not factor in at this point but will later. Create and save a Pagesetup datatype in the Workbench for the Epson 7900 with the relevant settings. Assign the Output, Media and Job Ticket created previously. Correct paper profiling is integral to achieving a verifiable PASS for any ISO press standard. Create a Paper Profile in the Workbench. Select the Media created earlier. A list of the ink channels and dot sizes (represented by patches) available to the printer will appear in the Density Patches panel. The profile will be using all the light inks, for a total of 8 inks. The Epson 7900 is a variable dot printer, having 4 patches or dot sizes per ink (patch 1 = no dot, patch 2 = small 33% dot, patch 3 = medium 67% dot, patch 4 = large 100% dot). Select Print Density Chart (All Patches) from the toolbar. When the chooser window appears, select the Media, Pagesetup and Job Ticket, then click Submit. The Density Chart will be printed. Allow a few minutes for it to dry once printed before measuring the patches. Once the printed job has stabilised it will be ready for measuring. Connect a supported Spectrophotometer to the Client computer. Select the Measure Patches option. This will display a list of supported instruments. Select your device from the list and click OK to continue. The Client will connect to the instrument and display the measuring window with the first patch highlighted and ready to measure. The first patch to be measured in each ink channel is the paper itself. Measure each patch on the printed density chart in order. The patches will highlight in turn and return to the first patch once the last has been read. If patches require re-measuring, simply click on the patch and read it again. If reading a chart with some patches turned off, make a dummy measurement for the absent patch or skip it by clicking the next printed patch. The chart displayed in the Client shows all patches. Click Apply when all patches have been read to close the measure window and store the measurements in the Paper Profile. L Values will appear in each patch. Select File menu > Save to save the measurements in the database. This is the process by which the dots fired when printing through this Paper Profile are chosen. Each density patch is a 100% coverage area made up of the colour and dot size it represents. Patch selection is a process learned through time and experience with the printer. There is no set patch combination that works on every printer. Printer model, print mode, resolution and print media are all factors that can influence dot choice. Patch selecting is a balance of getting the required colour density on paper vs not putting down too much ink, causing flooding. Large dots (number 4 patches) can sometimes cause flooding. The image here shows the patches selected for this profile. Light Light Black – Patch 2 and 3 on. Patch 4 is turned off (by clicking in the upper half of the patch) as the large dot (4) can cause flooding when mixed with other inks at this resolution. Light Black – Patch 2 and 3 on, 4 off. Patch 4 is prone to flooding and high levels of density coverage are best achieved using the Black Ink channel. Note: Given the choice between choosing a light ink patch 4 vs a dark ink patch 2, generally patch 2 of the dark is better as it gives similar density using less ink. Black – Patch 2, 3 and 4 are all on. While the measured L value of Black patch 3 (13.64) is lower than the L value of 16 required for the Fogra standard, the large black dot is useful for achieving good shadow density when needed. Also the large black is used only for the darkest area of an image and normally used on its own, so flooding caused by mixing with other inks is not a factor. Light Cyan – Patch 2 and 3 on, 4 off. Cyan – Patch 2 and 3 on, 4 off. Note: The choice of Light Cyan and Cyan may differ if a Paper Profile is being created for a bi-directional media setup. Here is an example where experience a printer comes into play – when printing bi-directionally, occasionally the small Cyan dot can cause visible moire pattern in large areas printed of predominantly Cyan. This is not uncommon to variable inkjet printers – the small size of the dot, its placement, the white space left around it and how that is perceived by the eye. Taking this into account, as a preventative measure LC patch 4 could be left on and Cyan patch 2 turned off. The presence of the large Cyan may require the paper to be set with lower ink limits to counteract flooding. Why not leave LC patch 4 off? Looking at the print chart there would be too much of a visual jump as the printer went from light cyan towards dark cyan areas. You can check these for jumps when you print the Linearisation charts later. Light Magenta – Patch 2 and 3 on, 4 off. Magenta – Patch 2 and 3 on, 4 off. Patch 4 may flood, be too pink/red (not magenta coloured). Note: Light Magenta and Magenta dot choices for bi-directional media may be influenced for the same reasons as Cyan (above). Yellow – Patch 2 and 3 on, 4 off. The big yellow patch 4 often causes flooding and is visually almost no different to patch 3. Note: The L values between yellow patches vary very little. If you hover with the mouse pointer over the patch, the tooltip will show the a and b values shifting by larger amounts. Once the patches have been selected, save the Paper Profile and assign it to the Media via the Paper Profile button in the Media datatype created previously. Return to the Paper Profile when this has been done to continue the calibration. Ink limits need to be set to prevent flooding of the page when multiple inks are printed on top of each other. This limiting is done because when using a Media and Paper Profile, Blackmagic is taking over control of the printer and its printhead, meaning the printer’s built-in ink limiting is not used. Click on the Ink Limits tab above the patch display area in the Paper Profile screen. Leave the 8 inks at their maximum (100%) for now and the Algorithm set to Linear 4.0. This is the default ink limit algorithm and the most appropriate for ISO proofing and this setup. Click on the Configure InkLimit Chart button. 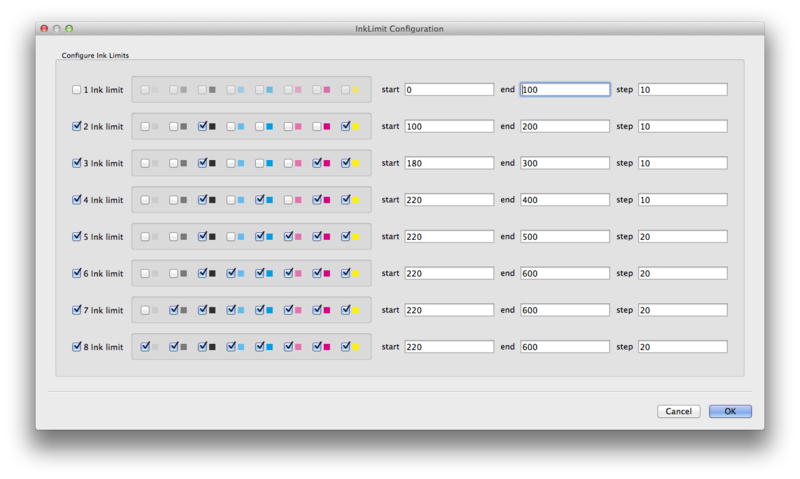 This will display a popup configuration window showing the number of ink limits in the configuration and the inks used. Configure the settings like this (see image) and click OK. There is no need to set the 1 ink limit as 100% coverage of a single ink should not be an issue after appropriate density patches have been chosen. The other inks are setup so that only one line prints on the ink limit chart for each ink combination. If you leave all the ticks enabled the chart will print every available combination of inks, which can make the chart very big. If paper use is not a factor feel free to leave all ticks enabled. The inks chosen for each ink combination above are generally in the order most likely to flood first. Select Prink Inklimit Chart or Print Inklimit Chart (Separate Jobs). This is a personal preference. Printing as separate jobs means the individual charts can be nested, using less paper. Keep in mind when the charts print that areas of the charts will be very wet. Examine each chart and select a limit for each number of inks. Look to use the highest ink coverage before the patches begin to flood, invert or look dull. 1 ink limit should always be 100% unless a lower coverage is necessary for a particular reason. In most circumstances Separation Control can be handled automatically. 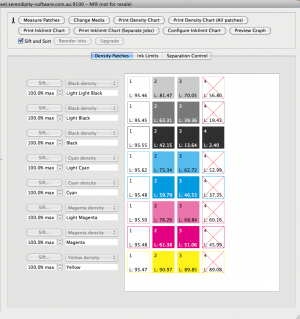 The curves in the Separation Control tab show the approximate points at which the Paper Profile will tell the printer to crossover from using light inks to darker inks for a colour channel and the amount of each ink used at various coverage levels. Process colours with only one ink channel (e.g. Yellow) do not appear in the graph. The light to dark ink crossover points can be adjusted using the Ink Start Controls. Leaving the Ink Start Controls set to 0% applies automatic ink separation. Once the Paper Profile has been created and saved to the Media, the printer needs to be linearised. This brings the printer to a neutral, known state making sure that 30% Cyan actually prints at 30% Cyan (for example). Linearisation also aids in gray balancing the printer. When the chart is printed all other colour management (except for the Paper Profile) is disabled. This way, quick linearisation updates can be done without having to remember to disable ICC’s, correction curves etc. The Linearisation Curve should be updated (reprinted and measured) on a regular basis. This returns the printer to the same state it was when the ICC profiles were originally applied. Select your Media from the list of available items and check the Use Lab tickbox. Select the instrument to be used (in this case an iSis) and print the chart. Before printing a popup will appear asking if you want to “Apply Colour Corrections to the Linearisation Chart”. Choose the default “Don’t Apply. Print to Linearise” option. Pick the Pagesetup created previously (with assigned Job Ticket) from the print dialog and click Submit to print. Once printed allow the chart to dry and stabilise before reading begins. Ensure the correct instrument is selected and click the Measure button. Measure each patch or strip in turn following the instructions at the bottom of the window. To re-measure a strip simply select it and measure. When all readings have completed, Save the chart. If the Media does not already have a curve applied to it (as in this case) a save window will appear to enter a name for the curve. Enter a name and OK to save. When the curve is saved it is automatically applied and saved against the Media datatype. If linearisation curve data already exists for the Media, Cancel, Create New or Overwrite options are available. Now the Media is linearised, the next step is to create an ICC profile. Select Submit menu > ICC Target. Use the file chooser to navigate to an ICC target of choice (in this case an IT8/7.4 Visual) and Submit it to the Pagesetup/Media/Job Ticket. Submitting using the ICC Target option ensures all ICC, dot gain and colour correction is disabled for printing. ICC target charts are generated by ICC creation software, they must be submitted in a TIFF or EPS format. Once printed, check the ICC target. This is another indicator of your Paper Profile settings. If there are wet or dull patches (other than a few in the very dense areas), or if the chart is too light, you will need to go back to the Paper Profile and re-select patches or set new ink limits; re-linearise and print the target again until it looks OK.
Leave the printed chart it to stabilise before measuring the values. This time will vary depending on the media and ink set. At least 30-60 minutes drying/curing time is recommended. Once the chart is ready, measure it using your ICC profiling software and create the ICC profile. Note: Output ICC profile creation is not covered in this document. Consult the relevant ICC profiling software documentation for details on the creation of ICC profiles for the media type and print process standard. In the Workbench select the Media being calibrated. In the ICC Profiles (Output) panel click the Choose ICC Profile button. Click on the Upload File button in the ICC selection window. Navigate to the saved ICC profile, select Open. Choose the Printers folder and click OK. The profile will be assigned to the Media. Open the Calcheck application (Application menu > Calcheck). Select a supported spectrophotometer from the drop-down list. Click Print Chart to submit and print a Calcheck Chart, either generated from your Press ICC profile or an imported chart. This can be printed using either Relative Colourimetric intent (selected in Job Ticket) if the paper has a white point close to the Fogra standard or alternatively, use Absolute Colourimetric intent. Wait a few minutes for the printed chart to stabilise, then measure it using the Calcheck application. If you get a PASS result, the printer has been successfully calibrated to the chosen press standard. If the calibration FAILS slightly and you have iterative ICC software, you can iterate (or optimise) the profile to pull it into standard and try Calcheck again. If your ICC software does not have iterative or optimisation function, and the calibration fails by a large Δe margin, it’s back to the beginning to try different settings in the Paper Profile. The Media created for this guide was Calchecked with charts printed using both relative and absolute colourimetric intents. It PASSED the Fogra 39 standard in both cases.